If you want to eat, you have to work. If you have children, you'd better support them. If you break the law, you have to pay. If you tap the public purse, you'd better be accountable. Now she abandons all judicial restraint in a scathing critique of the system - filled with realistic hard-nosed alternatives to our bloated welfare bureaucracy and our soft-on-crime laws. "Stuffed with terrifying tales of juvenile crime. Frightening but fascinating." -- "USA Today""Should be required reading for anyone who cares about law and order: how it has been undermined and what can be done to fix it." -- "New York Daily News""She makes advocates of Tough Love look like marshmallow liberals...Pithy and opinionated, with many real-life case histories, this book is an eye-opener for the politically left and an 'All Right!' cheer for the right." -- "Publishers Weekly"
As I read this book, I could hear Judge Judy's voice telling me these stories. It is excellent and makes me appreciate this lady very much. 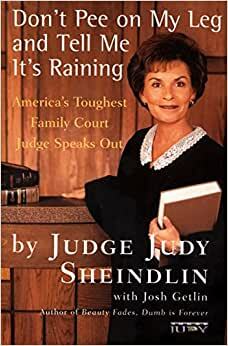 Judge Judy is not just a wise judge but an excellent author. When I would start reading this book, it was hard to stop. Reading this book, I just am amazed by her sense of humor since so much selfishness, greed and lack of respect come before her in so many cases each day. She's tough, she's honest and she is smart with conviction. If every judge was like her and every lawyer, policeman, caseworker, etc. maybe people would grow up. This book is a compilation of so many actual experiences that show the wisdom of this Judge. I really enjoyed "Don't Pee on my Leg and Tell Me It's Raining," Sounds like her Dad taught her well. 5.0 out of 5 starsJudge has great ways to improve families. It's a great fun book to read. I usually read it whilst having breakfast - live alone so it's not being rude. Made me realize how the justice system works, or doesn't work correctly, so I will take more care to find out about my local judges and abilities, before I automatically vote them all in for another term as before. This country is going downhill and if all judges were of strong mind as Judge Sheindlin we could start making things better here. Stop teenage pregnancy! Here, here! And review every case of people receiving cash for doing nothing in return. I am tired of being told to pay more and more taxes to provide for bums to sit and do nothing. If you have seen Judy on her TV show, you know the style in which this book is written. She is intelligent and funny, but after a few chapters, I found the book to be rather repetitive and predictable. What she has to say is simple common sense. It makes you wonder why politicians ignore the fact that if they keep doing things as they always have, the result will always be the same! My recommendation - if you can get the book at a discount like I did, it is worth a read. People like Judge Judy is what this country needs and hopefully will have in the court system for the next few generations. I actually had to stop reading this book because it was sickening me and making me angry the dysfunctional families, welfare and child abuse, and criminals getting away with so much.